Gold continues to hold its own. In spite of market stabilization the metal is maintaining its shine. Find out why, here. This week, Your News to Know brings you the most important news involving the gold market and the overall economy. Stories include: The yellow metal is in a bull market, six reasons to buy gold in 2016, and how people use gold in the real world. As far as CNN Money’s Paul R. La Monica is concerned, there’s no question as to the question of *if* we are truly in a gold bull market or not. The gold rush is in full effect, says La Monica, with the metal posting a 20% total gain so far this year. The question left up in the air might instead be one of *why*: Why is gold still gaining when balance has been re-established on multiple fronts? Most were ready to attribute gold’s early-year gains to worldwide economic uncertainties, from North America to China to the global economy as a whole. But now, things are looking notably better: on February 11 crude oil likely bottomed and is now on its way up while the S&P 500 was up 10% through March 7. Common wisdom dictates that the yellow metal should have gone down in response, yet to the contrary, gold gained another 6% in the same period. There are several possible reasons for gold’s ongoing rally. Concerns over the prospect of negative interest in Japan and Europe are one, as is the belief that the Fed could make another hike as soon as June. Being a hedge against inflation, gold often prospers from these speculations. But the real explanation for gold’s resurgence might be even simpler, according to La Monica. While gold’s recent price of around $1,270 an ounce is relatively high, it’s still 35% down from the metal’s 2011 peak of $1,920 an ounce, meaning gold should be (and probably still is) considered a bargain. Nicholas Colas, chief market strategist at Convergex, urges Americans not to forget market fundamentals when assessing gold. The metal is no different than other commodities, says Colas – supply and demand dictate the price at all times. Right now, mining output is sluggish and could lead to lowered gold production, while demand for both bullion and ETFs is as high as ever, slowly causing an opposite of the glut scenario that the oil industry is currently facing. In a recent analysis, Evergreen Investment discussed what makes gold attractive, and why people may want to consider buying some. It doesn’t take more than a brief look at history to see that gold has withstood the test of time, while all other currencies have ultimately crumbled. Yet, in recent years, many chose to abandon the safety of the metal for assets like stocks, which sometimes can offer larger short-term returns. Now, Evergreen’s investment team believes we might be at the perfect re-entry point for gold, and they back their opinion with six good reasons to buy gold. 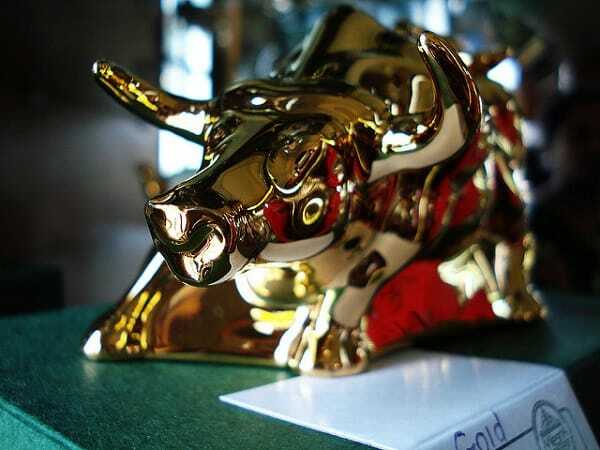 Gold might soon enter a bull market: The moment gold bulls have been waiting for seems to have come around, with the metal looking like it’s reversing course from the past few years. If technical trading patterns are any indication, Evergreen believes that the yellow metal might be facing an upswing that would make entry increasingly more difficult. The metal is still out of favor despite the recent rally: Adding to the first point, investor sentiment is still mild despite the recent surge, possibly making this the ideal time to buy – Evergreen’s team compares buying gold now to buying stocks in April 2009. The Fed’s ability to make further hikes is limited: Evergreen believes that the Fed’s ability to manipulate interest rates is constrained – further tightening will likely only lead to reversals later on. As was the case with other banks trying to raise interest rates, the Fed might soon face the possibility of flat or even negative interest rates. The dollar’s room to run is limited: Everyone’s talking about the strong dollar, but in reality, its growth might soon be reaching its limits. Evergreen notes that the greenback is overpriced and could be facing a correction, which would be very good news for gold due to the inverse correlation that it often has with the currency. Central banks’ ‘creativity’ spells bad news for investors: As if negative interest rates that charge investors for holding cash weren’t bad enough, central banks are now brainstorming ideas that could spell trouble. While the Fed’s future policy is unknown, there’s a good chance that it will cause falling interest rates – historically, these have been among the most important drivers of gold prices. Physical gold might get harder to acquire: Last but far from the least, the gold market could very well find itself strapped soon – if investors aren’t able to secure enough physical gold amid a concerning period, prices will likely surge as a result. In a time when gold is the best-performing asset of the year, detractors are quick to point out that the metal lacks uses in the real world and only serves as a store of wealth. To answer this, Business Insider’s Elena Holodny looked at a World Gold Council table that details how gold was used over the last few years. Jewelry demand leads the pack: In 2015, 2,414 tons of gold were used for the production of jewelry, with the biggest chunk being supplied in the fourth quarter (Q4). Coin and bar demand takes a clear second place with a little over 1,000 tons being bought to store wealth in both 2014 and 2015. Q3 2015 saw the highest quarterly gold demand, with nearly 300 tons being bought by investors. Next up are central bank acquisitions amounting to a little under 600 tons per year. Among central bank purchases, a spike in Q3 and Q4 2015 demand is notable with 40-some additional tons being bought compared to earlier quarters. Of the listed groups, technology takes last place – both 2014 and 2015 saw a little under 280 tons of gold used to manufacture electronics while 19.9 and 18.9 tons were used up for dentistry, respectively. Gold coin buying has quadrupled since last year. Read about this here.